Josh surprises me every week. I like the days when he’s a powerhouse and does what Abbey asks him with energy and strength. I’m not so fond of the days he’s relaxed. When he lets us move his body and doesn’t seem to participate. I’m never quite sure why but I got a glimmer yesterday. I’ve suspected in the past, he knows how much exercise he can handle during a session. And how tired he is by the end of a session. Yesterday, he was loose-muscled, relaxed, smiling and pretty much uncooperative. I felt a little sad. I expected more from him. We were almost through the session, in the last ten minutes of the hour. Josh was back in his chair and Abbey told him they were going to do reaches and I found out why Josh had been so careful earlier in the session. He’d been waiting for the chair work. 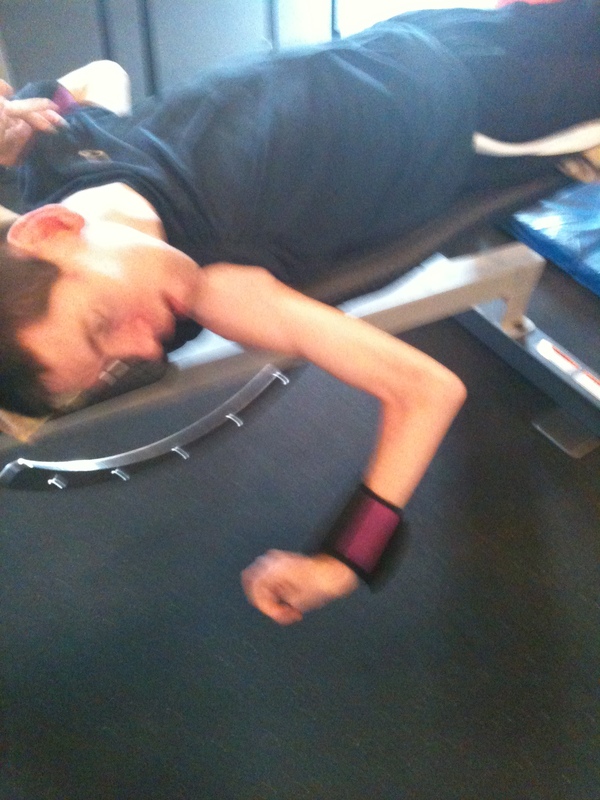 He’d saved his energy for the reaching exercise. He wanted to try something and he made sure he saved up enough strength to do it. I very seldom cry when I look at Josh. He’s so vibrant, and sweet. He’s full of love and eagerness for living. I’m proud of him but he did something yesterday that took my breath away. Abbey put the ball on his tray and told him what she wanted him to do. He needed to block the ball with the right arm and reach out and hold the ball with the left arm. For a few minutes Josh sat there and I feared the whole hour would be him letting Abbey do the work for him but I could see him thinking. 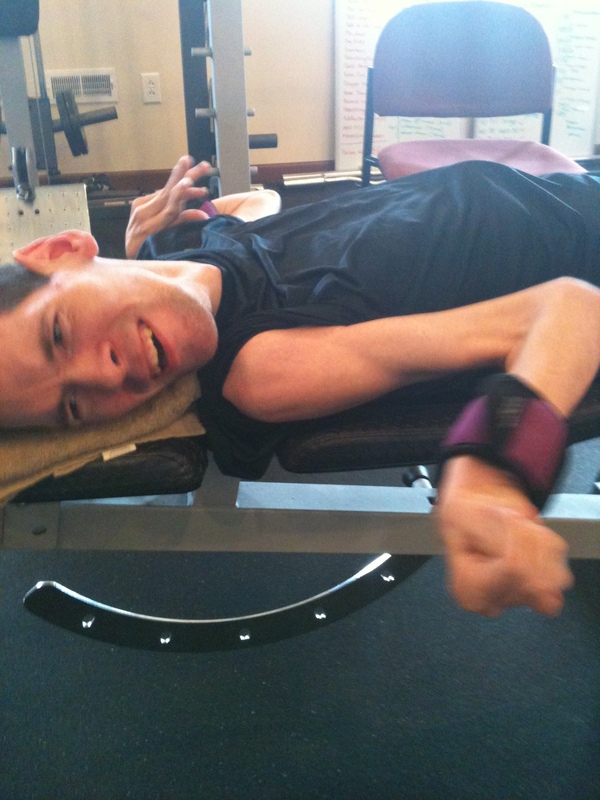 On a regular day, Josh winds up his left arm, going into a hard reflex before he can reach out. But last week, we put his home-made dice roller on his tray and he practiced while I worked out. And we saw him do some pretty amazing things. Apparently, he thought about that all week because yesterday he held his left arm in front of his chest. Quiet, still, no movement and most of all-no reflex. Very carefully, with full control, he raised his left arm straight up and put it on the ball. I had to fight back the tears. I fight them back now just thinking of what I saw. this didn’t happen just the one time. He did it at least four times and he stayed in control for all of them. Until he got tired. Once he wore out, the reflex came back and I understood why he’d been so careful to conserve energy earlier in the session. He comes into the workout with his own agenda. The lack of speech makes it hard to communicate with Abbey and me. Before I go onto the next session, I’ll leave one more picture from this one. Abbey pulled the ball away because Josh was holding both arms midline. He was within inches of touching his hands together. She was so proud of him and this photo will show you how proud Josh felt. I missed updating last week and want to share a highlight with you. When Josh first started on the weight bench his arms went down and there they stayed. 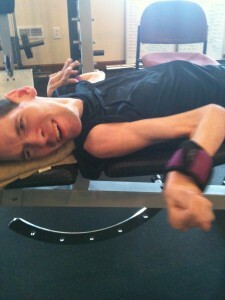 We were happy just to see him tighten the right muscle groups even if it didn’t move his arms. Monday this is what we got. here he visually finds his hand. Look where his elbow is and while you’re looking check out his bicep. The next step is to learn to rotate his arm in toward his stomach. He’s got the strength for it, he just needs to figure out the mechanics of it. We can’t forget the left arm. He’s getting that one up pretty good. That’s it for this week. Josh is absolutely loving the work outs. Who knew? I certainly didn’t. Exercise has never been high on my list of priorities. Circumstances have changed my opinion. And every week I watch Josh, I’m encouraged, inspired, and blessed. 13 Responses to He took my breath away. 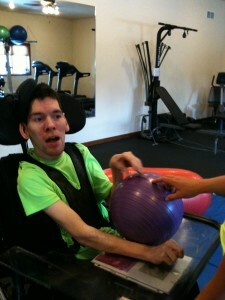 Wow, wow, wow Josh you are doing absolutely awesome……When I look at pictures of you I see “bubbles and sunshine”. This is new phrase I got from Ryan. He stayed home with Maddy on Wed due to Maddy having pink eye. I asked him how she was doing, he said she was great all bubbles and sunshine. This means she was smiling,playing, and happy, just having a great day. Love ya kiddo. Nita, Josh amazes me every day. There are so many things we need to do and so little time in the day to get them all done. But watching him work out is something I never thought I’d see and I’m so grateful it came into our sphere. Wow, so inspiring! Brought tears to my eyes. Josh, I’m so proud of you – what dedication and determination. Just awesome! When I think of how careful and determined he was to hold that arm in position and use a small, controlled movement I absolutely tear up. I hope, in some small way, you all can share in that. It was amazing to see. Wonderful insights, and thanks for publishing this. Thank you for reading. I love sharing Josh’s updates. As usual, I got teary eyed too. His journey is so important to all of us. Making the brain work with your body is not an easy task. The determination to do that has to be monumental. No wonder he gets tired. Repetition must be very important in that journey. Carol, so glad that you have the insight to see the progress. That includes Abbey. Thanks for including us in your journey. Marilyn, I know. I can’t watch him without having my heart taken right out of my chest. I’ve watched him for 32 years and this is the first time I see him really working at something. I told Abbey the other day how exciting it is for me to see Josh doing something so normal. I had no idea he would get so involved in something physical. It just lights us up to watch him. Ooh, look at that muscle! Josh, you’re amazing, and you inspire everyone around you. Every week you get better and better, stronger and stronger. Way to go! 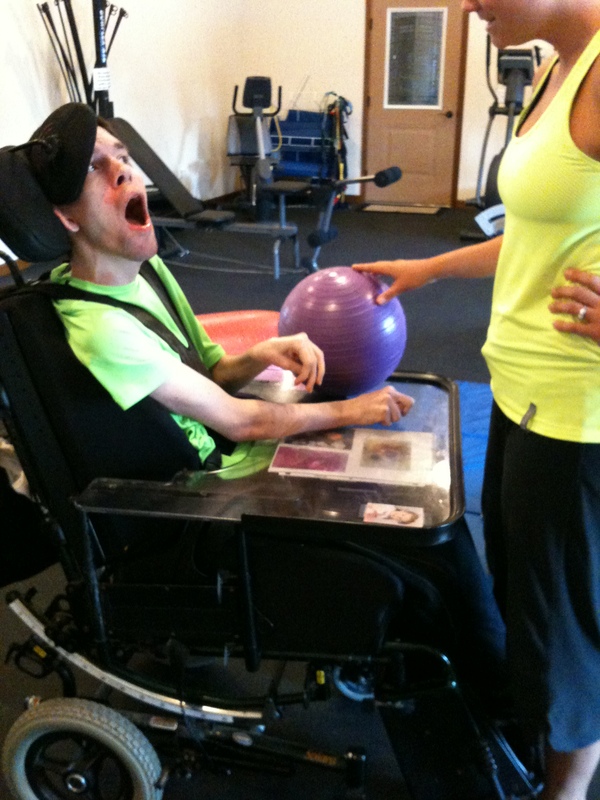 thank you for stopping by and reading Josh’s update. It’s exciting for us. I hope it is for others too. Thank you, Penny. 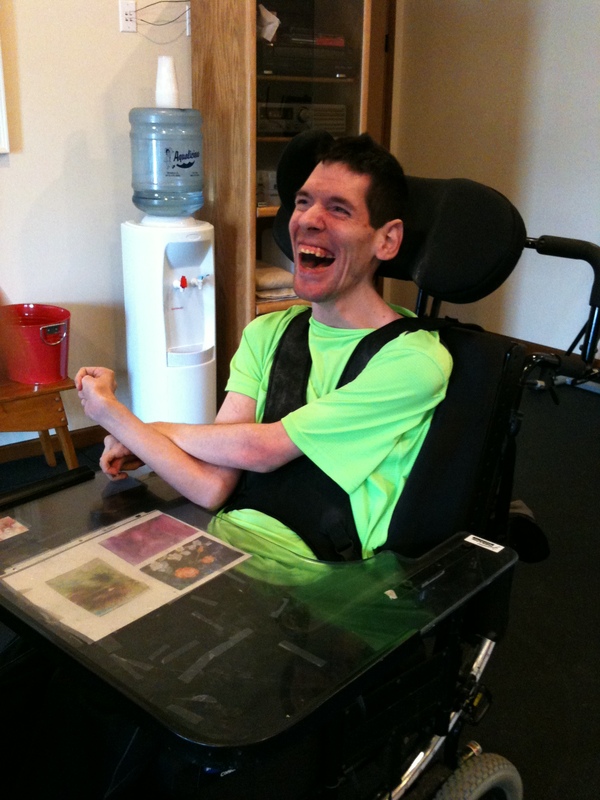 I love that you took time to stop by and read Josh’s update.